This is the second CD appearance of Campoli’s recordings of Bliss’s Concerto and Theme and Cadenza to appear on the Beulah label. You’ll find the previous incarnation on 3PD10, where they were coupled with the Tchaikovsky concerto conducted by Argenta. This label has proved remarkably loyal to the eminent violinist, recycling in the interests of furthering volumes in their Art of Campoli line, one I happily endorse. Bliss wrote the Concerto for Campoli. There’s an amusing illustration of the working practices the two developed in David Tunley’s Ashgate biography of the violinist. Spotting a ‘bad’ passage Campoli would scowl and exaggerate the difficulties, whilst suggesting alternatives, smiling beatifically at the result of his handiwork and cooing ‘beautiful’ at Bliss. This cat and mouse game, in which the poker playing South Londoner was by no means outsmarted by the composer, extended to the finale’s bridge passage between cadenza and conclusion. Campoli wanted to plough on from the cadenza, whilst Bliss wanted his mysterious gauzy orchestral half lights preserved. Bliss did actually admit afterwards that he wasn’t entirely sure as to which he preferred, so that at least was a tribute to Campoli’s persistence and suggestive skill. It’s a perfect vehicle in any case for Campoli’s own special brand of bel canto lyricism and virtuosity. One of the most magical moments comes in the gorgeous passage for violin over a harp and pizzicato string accompaniment in the first movement – something Campoli and the composer-conductor negotiate with wonderful warmth. It’s one moment among many. Campoli’s powerful spicatti are flourished in the central movement, playing which is warmly avuncular, and come the finale and we find him retaining tonal body even in the more strenuous passages of the Andante sostenuto pages. The Zingaro writing fits him perfectly; verve and buoyancy drama abound. There is, incidentally, a live Campoli-Bliss performance of the Concerto from 1968 which is more expansive all round. The Theme and Cadenza for solo violin and orchestra is an earlier work and derives from incidental music Bliss wrote for a radio play written by his wife, Trudy. Campoli had actually played it in March 1949, though he had been beaten to it by two eminent players in the shapes of Max Rostal and Henry Holst. Brief though it is, it’s highly violinistic – as one might expect given the provenance – and is suavely performed. The remainder of the programme delves back somewhat. The Paganini-Kreisler was, I think, the first recording of the work since Kreisler’s own with Ormandy. Naturally ‘Camp’ – splendid cantilena - and Victor Olof give it with panache. There’s a semi-rarity in the case of the Heifetz arranged Hummel, and a warmly textured Debussy in the familiar Hartmann arrangement. 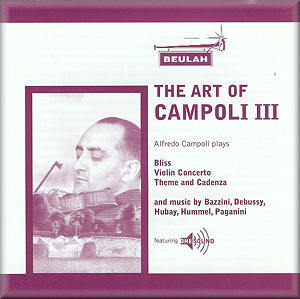 One of Campoli’s first recordings for Decca back in 1931 had been Bazzini’s La Ronde des lutins. This isn’t it, being a 1947 remake with steadfast Eric Gritton, but it is played with similarly breezy insouciance though not at the claimed 2.58. Even Campoli couldn’t get through it in that time; add a minute and you’re there (this affects Beulah’s total timing for the disc, which for once underestimates itself). Then there’s the cheeky Hubay Zephyr to end things. Other companies have issued some of these pieces. The Paganini-Kreisler is on Dutton CDBP 9718 which is smoothness itself; this Beulah, by comparison, is quite torrid with plenty of Decca ‘frying tonight’ bacon fat sizzling away. My own copy of K1822-23 doesn’t sound quite this sizzly, but in any case I prefer the Beulah. This also goes for Dutton’s transfer of the Bazzini. Beulah is squishy but Dutton is airless; of the two on offer I prefer squish, but you may not. Another worthily re-ordered entrant to the Campoli lists then, which have elsewhere been enriched in the area of chamber music by the appearance of three previously unknown non-commercially recorded sonatas. So, let me extend a hope that we will similarly one day get the performances of Walton’s concerto that I know have survived, and that those other big concertos he essayed – including those by Elizalde, Delius, Bax, Harty and Sibelius – are in a box somewhere awaiting restoration. Fabulous thought for us Campolites!